Preheat over to 425 degrees. 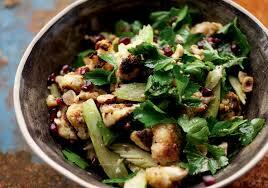 Mix the cauliflower with 3 tablespoons of the olive oil, ½ teaspoon salt and some black pepper. Spread out in a roasting pan and roast on the top oven rack for 25 to 35 minutes, until the cauliflower is crisp and parts have turned golden brown. Transfer to a large mixing bowl and set aside to cool down. Decrease the oven temperature to 325 degrees. Spread the hazelnuts on a large baking sheet lined with parchment paper and roast for 15 – 20 minutes. Allow the nuts to cool a little, then coarsely chop them and add to the cauliflower along with the remaining 2 tablespoons of oil and the rest of the ingredients. Stir, taste, and season with salt and pepper accordingly. Serve at room temperature.